Knai Bang Chatt features three unique dining venues: The Strand, The Lounge and The Sailing Club, all offering a variety of refreshing beverages and an extensive menu of local seafood and tasty western favorites. From locally to globally-inspired cuisine, we feature fresh and local products at each venue, including the abundant fish, crab, and seafood that is collected daily from the surrounding sea. We cater to any and all dietary requirements. At least half of the fruit and vegetables we serve are grown at a garden 20 metres from the restaurant. The rest of our produce is sourced from from local producers and organic farmers throughout Cambodia. One of The Strand’s best. Authentic French cuisine made more delicious with local Cambodian flavors. 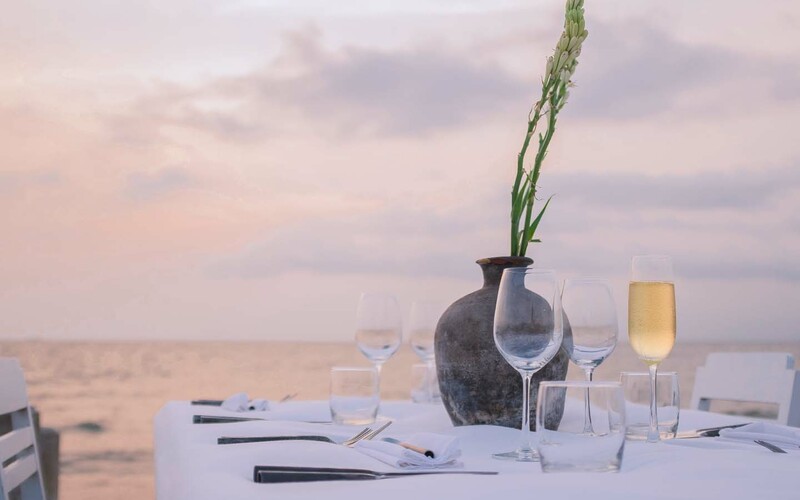 Nestled in a serene corner of our resort, The Strand is Kep’s high-end restaurant. Our Chef’s feature menu is meticulously composed, mixing elements from a range of global cuisines and palettes. The Strand draws directly on our local garden, embodying our earth-to-plate concept. Seafood is collected daily from local farmers. Set in a restored traditional wooden fisherman’s cottage directly over the sea, The Sailing Club Restaurant & Bar has a casual and family friendly atmosphere, making this the ideal place to relax and enjoy Kep’s breathtaking sunsets. On offer are a variety of cocktails , wines and beers, with an extensive menu of local seafood and tasty western favourites. With a beach club setting, including ping pong and pool, The Sailing Club is a place to while away the hours. With sweeping sunset views overlooking the Gulf of Siam, The Lounge is Kep’s premier cocktail and wine bar. Sitting right on the water’s edge, the space is open and airy. We offer both classic and signature cocktails, along with refined international high-end spirits, wines and beers, and a selection of small tasting plates. The Lounge is chic in design, taking inspiration from modern Khmer architecture. The perfect venue for a later evening drink.